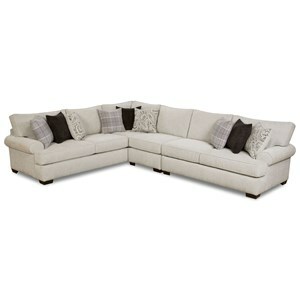 This stationary sectional features an optional ottoman with cushion top that can be added to create a cozy chaise. The three-seat sofa is transformed by the additional of an ottoman base with long chaise-style cushion. Top the chaise base with the available ottoman cushion to turn the two-piece sectional into a stationary sofa with matching ottoman. 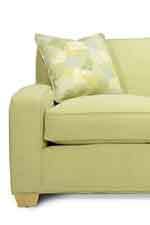 Customize with your choice of upholstery fabrics! The Horizon Stationary Sectional Sofa with Chaise by Rowe at Thornton Furniture in the Bowling Green, Alvaton, Glasgow, Scottsville, Franklin area. Product availability may vary. Contact us for the most current availability on this product. C575-000 Chaise Ottoman 1 30" 49" 21"
C570-000 Sofa 1 84" 38" 34"
The Horizon collection is a great option if you are looking for Contemporary furniture in the Bowling Green, Alvaton, Glasgow, Scottsville, Franklin area.